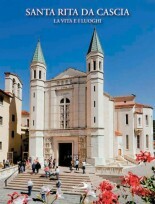 The Association of Towns of Valnerina, in cooperation with the Augustinian community of Cascia, the Opera of Saint Rita Roccaporena and the Administration of Cascia, has developed a new editorial product, as a result of numerous requests information from some of residents of Santa Rita and the faithful of all visitors to the town. Was born a new touristic and cultural guide about life and places of Saint Rita. A guide of over 300 pages structured in 6 chapters, simple and complete. In the first chapter Cascia of Rita outlining the historical and social context of Cascia at the time of Rita, in the second The Life of Rita , the life of Mary and all the events and the basic steps of its existence, human and spiritual, in the third Monastery of Saint Ritainstead deepen the artistic and religious aspects of the Monastery of Saint Rita, as well as in the fourth The basilica of Saint Rita all the iconographic and symbolic elements of the Basilica, from a macro description of places and then deepen each representation in a minute. The fifth chapter Roccaporena, birthplace of Rita is dedicated to Roccaporena where Rita was born and grew up and attention is about San Montano, the Rock Garden, the Miracle, the house, the house marital, the Shrine, the Grotto, the Lazzaretto. The sixth and final chapter Symbols of Rita finally, it delves into the symbolism, symbols of Rita: bees, flight, the screw the fig and rose. The guide can be purchased in all major regional and national libraries, libraries of Editions Saint Paolo of Italy, bookshops Giannangeli Angel of Cascia, and in all the shops and souvenirs of the holy city of Cascia and Roccaporena. During 2010 there will be the publication of the guide in various languages and in the web, and will be implemented in several other publishing, will organize events and promotions related to the tourist area of Valnerina.